This is one of the best hairspray ever! For all styling and all hair types, it lasts all day and provides shine. Anti-static, it resists humidity and will hold updos and bun very well. Its captivating and fruity perfume will delight you for sure! 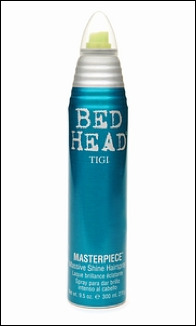 We love: the "Bed Head" range that packaging is pop, the smells are fun and the products are cool. Collection Hair tips: hold can 8-10 inches from hair and spray over styled hair or spot spray as desired. For finishing touch, hold 10-12 inches from hair in short bursts over finished hairstyle.